Posted on Sun, Nov 27, 2011 : 2:12 p.m. 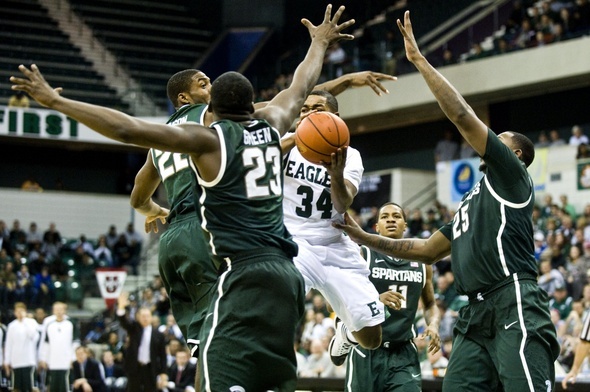 The Michigan State defense focused on shutting down Eastern Michigan leading scorer Darrell Lampley (34) on Sunday. Lampley scored three points in the Eagles' 72-40 loss at the Convocation Center. After nearly being tackled on his way to the basket late in the second half, Michigan State forward Draymond Green threw the ball behind his back. The "shot" banked off the glass and through the rim, then Green completed a 3-point play to give the Spartans a 32-point lead with 6:48 remaining in its game at Eastern Michigan. It was just one of those days for Green, where everything seemed to go right. For Eastern Michigan, the opposite. Green had a double-double of 14 points and 13 rebounds, leading the Spartans past EMU, 72-40, in the final game of the Spartan Invitational at the Convocation Center on Sunday. The game was part of an extensive football and basketball scheduling agreement Michigan State negotiated in 2009 with the state’s three Mid-American Conference teams. (The Spartans will also play football at Eastern Michigan's Rynearson Stadium in 2018 or 2020). It drew a season-high 3,711 green-and-white clad fans -- more Spartans than Eagles -- to the 8,784-seat Convocation Center. Eastern Michigan and first-year coach Rob Murphy concentrated their defensive efforts on Green early, holding him to just 2-of-5 shooting in the first half. "I thought (Murphy) did a great job in the first half of taking away some things," Michigan State coach Tom Izzo said. "He took away Draymond pretty good. We couldn’t even get him touches." Taking away Green didn't equate to keeping the game close. Eastern Michigan shot just 20 percent (6-of-30) from the field and trailed 25-13 at halftime. Michigan State dominated the glass, out-rebounding EMU 49-29, making it tough for EMU to take advantage of the Spartans' struggles from the outside. Michigan State scored 46 points in the paint. "Physical as they are in the paint, they were able to get second chance opportunities, and they scored 24 points off second chance opportunities, which really hurt," Murphy said. J.R. Sims led Eastern Michigan with 14 points. He was the only Eagles player to reach double digits in scoring. Eastern Michigan started with an aggressive press on defense, forcing Michigan State turnovers on its first two trips down the court. EMU's 2-0 lead off of a Matt Balkema lay-in would be the only lead the Eagles would see the entire game. Brandon Wood scored five straight and sparked a 10-0 Michigan State run that put the Spartans ahead 10-2 at the 14:05 mark of the first half. Eastern cut the deficit to 17-10 on a Sims layup at 7:48, but went scoreless until Antonio Green hit a 3-pointer from the corner off a Darrell Lampley assist with 31 seconds remaining in the half to cut MSU's lead to 23-13. Any momentum gained from the 3-pointer was lost when Spartans 6-10 center Adreian Payne was left alone under the hoop on the next possession. Payne emphatically slammed the ball to put State up 25-13 at the half. Payne finished with 12 points and eight rebounds. "They won the battle in the paint," Murphy said. "Because of their size and athleticism, I think they wore on us as the game wore on." Lampley, who leads Eastern Michigan in points and assists, was held to just three points and had five turnovers to three assists. Izzo credited Keith Appling with his team's ability to limit Lampley, who was averaging 15 points. "I thought Appling did an incredible job defensively. I really like Lampley. I think he’s a very good player," Izzo said. "I thought we took Lampley out of it for quite a while in that game and that credit goes to Keith." Appling finished with 11 points, five assists and no turnovers. "Darrell Lampley does a lot for us and they didn’t allow him to get into the seams of their defense," Murphy said. Eastern finished 16-of-56 (28.6 percent) from the floor, while Michigan State was an efficient 11-of-25 (44 percent) in the first half and 28-of-58 (48.3 percent) for the game. But Izzo acknowledged it was his team's rebounding, not shooting that won the game. "We got some layups and that skewed (our shooting perentage) a bit. I think a better one to look at is our 16 percent from the three," Izzo said. Michigan State all but put the game away by starting the second half on an 8-1 run. Appling found Brandon Dawson under the hoop for a wide open dunk to put the Spartans up 33-14 with 16:48 remaining. A 19-point deficit is by no means insurmountable in college basketball, but considering the Eagles had only scored 14 in the previous 25 minutes, it seemed unlikely. MSU opened the second half with an 8-1 run and EMU's defense began to collapse. "When you get down 18-20 points, the defense loosens up," Murphy said. "We had to gamble a little more on the outside for steals. ... In your mind, it's kind of demoralizing to the players when (the deficit) goes from 12 to 20, so we began to press a little bit." EMU scored on its next three trips down the floor -- including a 3-pointer from Lampley, and a 3-point play by Green -- but barely cut into the Michigan State lead due to its inability to keep Michigan State off of the glass after missed shots. "You have to come up with the rebound. And those second chance opportunities really hurt us tonight," Murphy said. The road doesn't get easier for the Eagles (4-2), who head to Syracuse to take on the fifth-ranked Orange on Tuesday. Murphy was an assistant at Syracuse for seven years before taking over for the Eagles prior to this season. "I think we kind of just gotta wipe this game out of our minds, it’s over, and go to New York and prepare for Syracuse in the next two days and see what happens," Murphy said. Pete Cunningham covers sports for AnnArbor.com. He can be reached at petercunningham@annarbor.com or by phone at 734-623-2561. Follow him on Twitter @petcunningham. Mon, Nov 28, 2011 : 2:53 a.m. It looks like the Hurons could use help from Earl Higgins, Kennedy MacIntosh, Fred Cofield, Grant Long, and Earl Boykins.